When Steven Henderson first arrived in Dubai at the end of 2005, half the current city wasn’t there yet – at least not some of its now-famous buildings and landmarks. As a real estate lawyer, Henderson would know. Having been in the United Arab Emirates just short of nine years, the Kiwi lawyer has been at the forefront of one of the modern world’s unprecedented booms. Dubai’s evolution from backwater to prominent global commercial centre has largely come in the last 20 years, but especially in the years since 2000. Henderson says that being in this environment has been highly stimulating. “When I first arrived, there was very much an emerging-market mentality. Laws were still being established and, in some cases, there weren’t laws at all. Henderson admits that his path to practising in Dubai has been slightly different to the route many lawyers with an eye to working overseas may have taken, where a lawyer practises in New Zealand for a few years before venturing off to London, Hong Kong or whichever city their heart desires and then returns home. 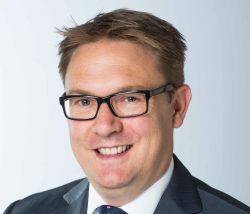 Instead, Henderson got his first position with Russell McVeagh’s Auckland office where he worked for eight years on the firm’s real estate team. It was only when his wife, a structural engineer, was headhunted by a company in Dubai that the possibility of Henderson practising overseas came up. This is an obvious contrast to New Zealand’s well-established legal framework, but Henderson says this challenge is part of what makes practising in the UAE an adventure. Because laws are new and their mechanism of enforcement, such as regulatory bodies, are continually evolving, lawyers have to be adaptable. Henderson cites strata laws as an example. Until 2010, Dubai had no real laws governing the various arrangements there normally need to be between buildings housing properties with multiple owners. Properties were being sold to people without any real constructs around them. No strata laws existed. As a consequence, lawyers initially had to create these structures themselves, on a contractual level. “It was daunting, but I really enjoyed it, because you have to go back to basics and create a lot of these legal constructs,” Henderson says. Living in Dubai, Henderson says, is always interesting. On the one hand, the depth of real estate projects means the city is in a constant flux, but the quieter sides to the city offer their own attraction. Henderson and his wife, along with their two girls, live away from the glitz and glamour of Dubai’s hotel skyscrapers, preferring one of the city’s older neighbourhoods. Their house is close to the beach, and parks abound. “Family and friends back home think we live in the desert, but there is lots of greenery,” Henderson says. Being closer to Africa, Europe and Asia than they would be in New Zealand, Henderson’s family also get the chance to travel frequently. This rounds off what is already a cosmopolitan experience in Dubai. Despite this, Henderson admits that it is hard not to miss New Zealand. He says it is challenging not to be close to friends and family and he misses the clean and green environment of home. Because Dubai is under a lot of development, which is exciting most of the time, it has nothing near the chilled-out, relaxed atmosphere that makes New Zealand a great place to live all year round, Henderson says. This feature is from NZ Lawyer's July issue #6.2. Download the whole issue to read more.